I love this story. I hope you do too. Quite suddenly and unexpectedly, one night in 1961, Berlin became a divided city. At first there was merely barbed wire fencing, then a wall. It was all done in such a hurry that mistakes were made. 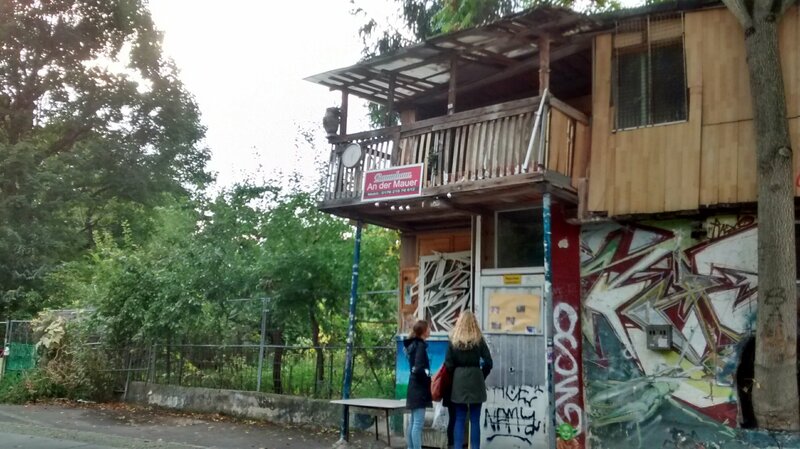 One tiny part of Kreuzberg that belonged to the Eastern sector got isolated in the West. The Americans – for it was in their zone – could do nothing about this unremarkable patch. It became an unloved and unlovely rubbish dump. Then along came Osman Kalin, an immigrant Turk. He wanted a vegetable patch. He cleared the land and started to plant seeds. As his patch became productive, he gave vegetables to schools, to the local church, to anyone in need. He cobbled together a rather ramshackle tree house. He became something of a local hero. Initially, the East didn’t mind. But when East Berliners successfully started to tunnel under his patch and escape he came under suspicion. The authorities came to interrogate him, and he welcomed them in his usual hospitable way. They gave up and left him alone. In 1989, the Wall fell. A newly united Berlin City Council began to see Osman’s ramshackle domain as an embarrassment. They gave him notice to quit. The local and wider community was horrified. 25,000 people signed a petition demanding he be allowed to go on growing his vegetables. He stayed. He’s 95 now, and doesn’t work so much on his vegetable patch, though his son does. He lives in a flat nearby rather than in the tree house. He’s still a much-loved local hero. I heard this story on a walking tour offered by Alternative Berlin Tours, led by the remarkable and endlessly interesting Dave. Very highly recommended. That’s a wonderful story! Something good during bleak times. What a heart warming story, thanks for sharing it. It was such a good way to end our holiday which has been a great experience, but stressful. I love this story! Thank-you for sharing it with us. I thought it deserved another retelling too. How uplifting. I’d like to think that 25,000 signatures would work similarly in say, Kensington & Chelsea, but sadly probably not. I’ve been very impressed by ‘people power’ in Berlin – for instance, keeping whole communities Starbucks and Subway free in favour of supporting smaller independent businesses. It is amazing what communities can achieve if they stick together. What an amazing story. Definitely heart warming. I thought so. A good note on which to end the ‘holiday’. With all the talk in the US about walls separating people, I like Berlin Wall stories with happy endings! This is why I still find that life is ‘wonderful’ – full of wonders and wonderful people. Thank you so much – made me smile. Oh, I know it must have been a pain when I did daily posts, but it was also my diary for me. Will also dig a bit around for Ellie’s blog, although I did ask to get her updates I never do and every time I have to go ‘fishing’. I wonder how she’s doing…. But I WILL come back to her – and bisous to you. I’m sorry you’re having difficulty signing up for Ellie’s blog. She hasn’t posted much lately, but is doing fine, has had her ‘all clear’, and her hair is growing apace!